Between 27th September and 24th November 2013 Gazelli Art House will show Last Space Remaining. The exhibition of new works by Spanish designer and artist Sergio Calderon and Russian artist collective Recycle Art Group, will examine the notions of fantasy and reality through two alternative approaches. Calderon’s multi-disciplinary, interactive installations invite the viewer to actively engage with the artwork and surrounding space, calling them to draw on their personal memories and ideas. That Calderon’s work seeks to be wholly subjective in this way represents his premise that reality is dictated only by our personal expectations of reality. In contrast, Recycle Art Group (comprising of Andrey Blokhin and Georgy Kuznetsov) explore the realm of “virtual reality” utilizing both recycled imagery and materials. The common thread running through the exhibition is the human search for perfection and the gulf that exists between these ideals and reality. As implied from the name of this Russian art collective recycling is a central facet of their artwork, whether this be through the use of recycled materials or recycling of familiar imagery. Their participation in Last Space Remaining follows on from their successful solo exhibition, Paradise Network, shown at Moscow’s Multi-Media Art Museum earlier this year and select works from this series will be shown by Gazelli Art House. 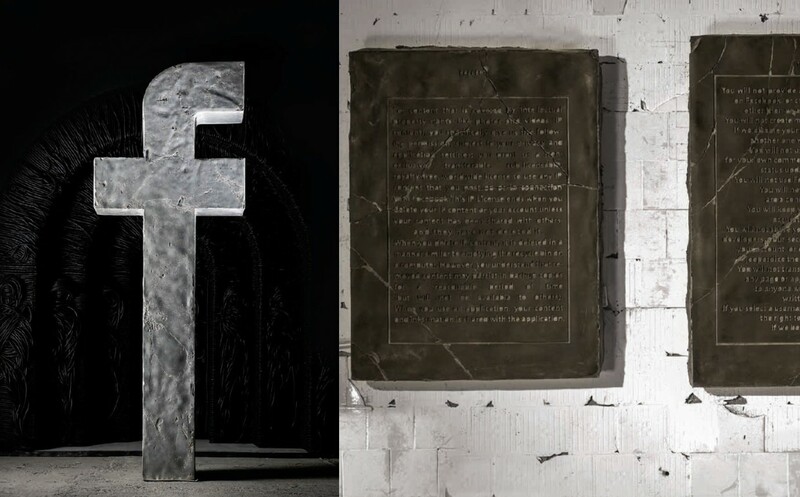 Facebook as a new social system with its own laws, customs and rituals and subsequently ask ‘What remnants of today’s society will survive and become part of history?’. The humorously titled work Tablets (a phone tablet cast in stone detailing social media’s Ten Commandments) suggests an answer; The commandments of the virtual age are not written in stone, but in a permeable digital medium. Blokhin & Kuznetsov strive to highlight the absurdity of this generation specific phenomenon in which Facebook has adopted the function of religion. Their blatant use of religious imagery and clear references to the architecture of places of worship in works such as F, suggests that the world’s spiritual-material dichotomy no longer exists, as we now live in two spaces – real and virtual.